The SunTech Vet25 Veterinary Blood Pressure Monitor quickly and easily provides reliable blood pressure measurements for wellness exams, spot-checks, and while monitoring companion animals before and after procedures. With the Vet25, users can set intervals to automatically monitor and measure systolic and diastolic pressures and heart rate. Utilizing SunTech Medical’s trusted, animal-specific Advantage VET BP technology, the Vet25 performs motion-tolerant BP measurements, delivering accurate results with no shaving or gel. The Vet25 is light, portable, and small enough to carry between rooms, making it convenient for both patients and providers. The monitor is battery operated and can also be powered by a universal A/C adapter that recharges the battery when plugged in. Using Bluetooth, BP data can be transferred to the trending and reporting PC application that comes standard with the Vet25. 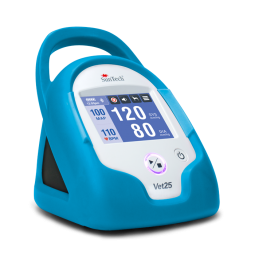 Reliability: Due to SunTech’s motion tolerant technology, the Vet25 has a high success rate for BP readings. Simplicity of Use: Intuitive touch screen interface provides all necessary features for reviewing, analyzing, and transferring BP data. Designed for animal hospitals, not researchers. Continuous Monitoring: Monitoring during procedures is simple with user-defined intervals for BP measurement. Memory: Up to 960 data points are retained, even when device is powered off. User can select specific measurement from device memory and perform automated BP averaging. Portability: Battery-operated device easily moved to different monitoring locations. 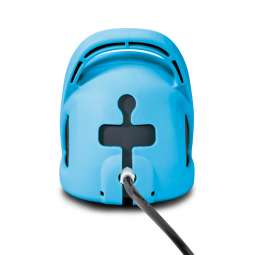 Rechargeable: Battery recharges when device is plugged into AC power, reducing disposable battery waste. Data Transfer: Data can be transferred to a data trending and reporting software application for a PC using Bluetooth. Use the PC application to export reports in either PDF or CSV format. SunTech’s veterinary products are not human devices re-packaged. We used data from companion animals to develop our SunTech Vet BP technology. In fact, our SunTech Vet BP technology has passed the ACVIM blood pressure protocol on anesthetized dogs and here’s a link to the journal article in Veterinary Anaesthesia and Analgesia. To request a quote for the SunTech Vet 25, simply click here. Learn more about the full line of BP cuffs that are available with the Vet 25 BP monitor, by clicking here. Brochure for the SunTech Vet25. Brochure for the SunTech Vet25 in A4 format. Quick Start Guide for the SunTech Vet25. User manual for the SunTech Vet25. You can store up to 960 measurements. The monitor has a revolving memory. When you take your 961st measurement, it will be listed as measurement #1. How do I delete data from memory? Select the Memory button and touch the Delete button. Before the memory is cleared, you will be asked to confirm or cancel the deletion. When you clear the Memory, you delete all measurements for all parameters. During continuous monitoring of SpO2 and temperature, with an Interval BP set for every 5 minutes, a fully charged battery should last at least 4 hours before requiring recharging. If only taking manual BP measurements, a fully charged battery should last for at least 150 BP measurements before requiring recharging. Fully charging the battery should take under 6 hours. Battery life is very dependent on the touch screen display ON time. To maximize life, SunTech suggests setting the Auto OFF timer to 1 minute. Yes. 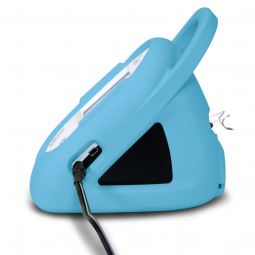 The Vet30 can be used on anesthetized animals as well as awake animals. Attach the cuff as tight as possible. Extra attention will be needed on species with dense or thick fur. If the cuff will not stay attached, check the hook & loop for fur and remove if possible. Are there other power options? Yes. The device is provided with a mains power supply that recharges the internal battery when connected. When the monitor is not connected to the power supply, the battery will allow the unit to be portable for use. What are the minimum and maximum cat & dog weights when taking measurements with the Vet30? There are none. Any cat or dog that has a limb that fits within the cuff ranges is acceptable. This video demonstrates the proper way to measure blood pressure using the SunTech Vet25 Spot-Check & Continuous BP Monitor for companion animals. Discover the Difference with the SunTech Vet25 Today!